Sunday 14th October saw me as the sole representative from BVR at the Royal Parks HM (everyone else was at Wellesley). This was my second time at this event, the first, 3 years ago was a beautiful sunny autumn day, this year was different, it was very cold and very wet. Royal Parks is a popular event and entry is via ballot, if you get in there are 4 coloured start waves for the 16,000 or so runners, crossing the start line can take over 30 minutes from the start time. I’d entered my name at the last minute after Heather reminded us the ballot was open. Glad I did as it is a lovely run. 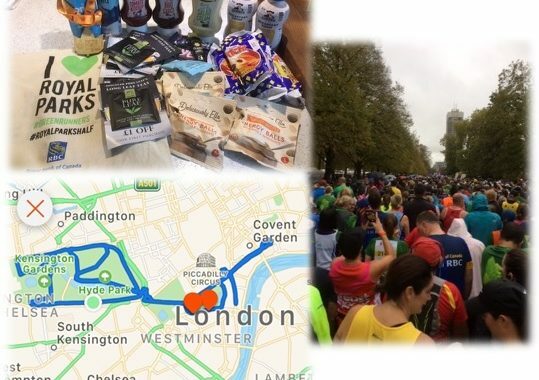 The route starts and finishes in Hyde Park and winds its way out towards Covent Garden via Green Park and St James Park, returning to cover more of Hyde Park and Kensington Gardens, and includes a run up the Mall to Buckingham Palace and past a number of other famous London landmarks. All the road elements are fully closed to traffic. The whole thing is probably contained within a square mile or so with lots of loops to make up the distance. The beauty of this is that you have always got very good crowd and charity supporters to keep you going, and more important – it doesn’t feel like lots of loops when you run it. It is also almost flat. Despite the weather we had several very good steel and brass bands playing for us so it has a lively buzz around the course. The event village has baggage storage and a food festival with various activities to keep your support crew entertained during and after the run. I can’t comment on this as it was so wet I did a quick change and headed for the tube. You get a t-shirt, a wooden medal in keeping with the location, a fabric goody bag and a very random selection of things to put in it! I’d definitely recommend putting your name in the ballot to run.